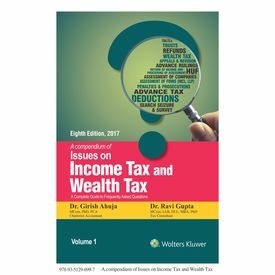 The book contains discussion over Technical and Practical Issues of Direct Tax in Question and Answer pattern. It contains approximately 3200 frequently asked questions with precise and comprehensive answers covering latest judicial decisions and amendments brought in by Finance Act, 2017. Provides updated answers vide latest judicial decisions and the Amendments in Income Tax Act and Rules. Dr. Girish Ahuja is an eminent speaker, a visiting faculty member of ICAI, ICSI, ICWAI and various Management Institutes. He has been a member of the Editorial Advisory Board of the ICSI. He is a member of the Direct Tax Committee and International Tax Committee of the ICAI and a member of the Expert Advisory Board of ICSI. Dr. Ravi Gupta, an eminent speaker, too, is a senior consultant to various companies, Non-profit making Organisations and have vast practical experience in handling tax matters of trade and Industry. They together have authored more than twenty books on Direct Taxes.